Engine 12 - Independent Hose Company of Frederick, Maryland. 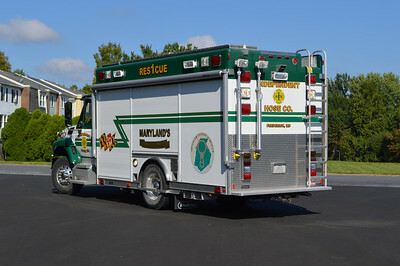 A 2010 Seagrave TB50CM equipped with a 1500/750 and serial number 78G16. 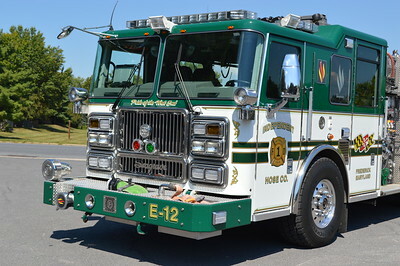 Engine 12 of Frederick, Maryland Independent Hose Company. 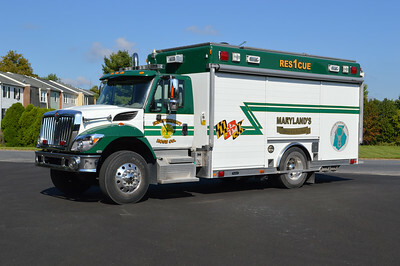 A 2010 Seagrave. Frederick, MD - Independent Hose Company - Maryland's oldest Fire and Rescue Company - 1818. 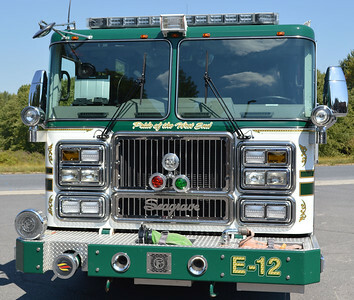 The front end of Engine 12, a 2010 Seagrave. 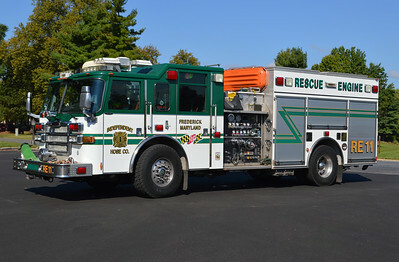 Frederick, Maryland Rescue Engine 11, a 2006 Pierce Dash 1500/500 with job number 17479. Independent Hose Company - Frederick County, Maryland. 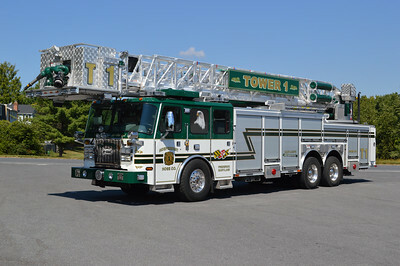 Frederick, Maryland Tower 1, a 2001 E-One Cyclone II that was rehabbed in 2013 by Patriot Fire. 95'. 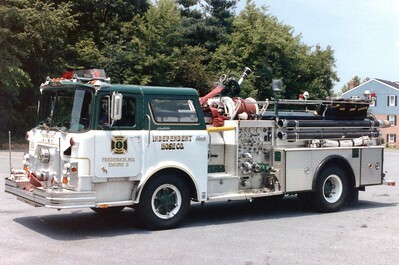 Frederick, MD - Independent Hose Company - Tanker 1 is a 1994 Peterbilt 357/4-Guys 1000/3000 and 4-Guys serial number F1620. 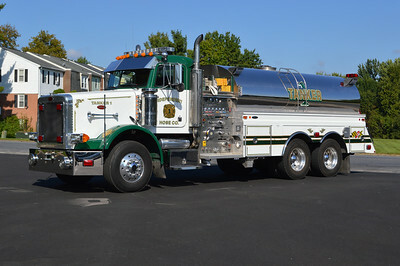 In 2012, this tanker was modified by 4-Guys to include new lights, front bumper, and cab visor. Frederick, MD - Independent Hose Company - ATR 1 is a 2007 International 7400 4x2/2008 Hackney. ATR is Advanced Technical Rescue and handles confined space, swift water, high angle, and collapse rescue. A rear view of ATR 1, a 2007 International 7400/Hackney. 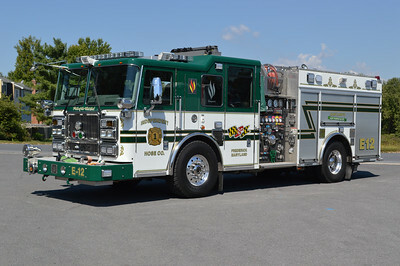 A bit out of the ordinary is Brush 16 from Frederick, Maryland's Independent Hose Company. 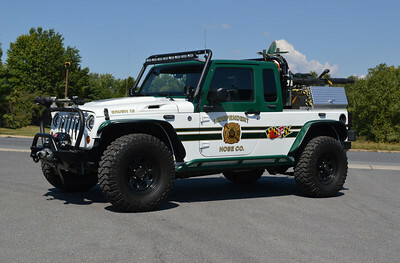 It is a 2012 Jeep MBV 4x4/2013 Rosenbauer equipped with a 75 gallon water tank and 10 gallons of foam. 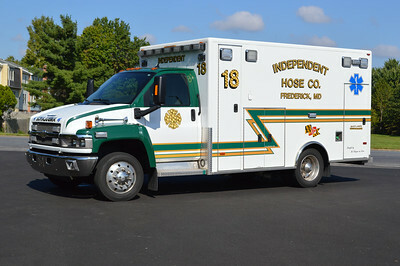 Frederick, MD - Independent Hose Company - "18" - a 2010 Chevrolet C4500 with a PL Custom ambulance body. 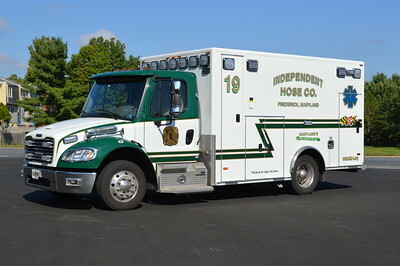 Frederick, MD - Independent Hose Company - "19" - 2015 Freightliner with a PL Custom body. Utility 1, a 1999 Ford F-350/Fibre. Former Brush 15. 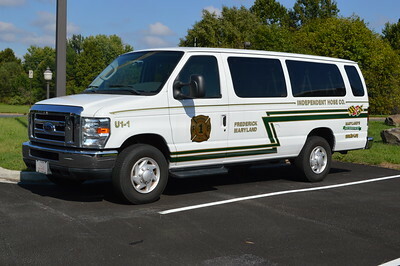 Utility 1-1 is a 2008 Ford E-350. 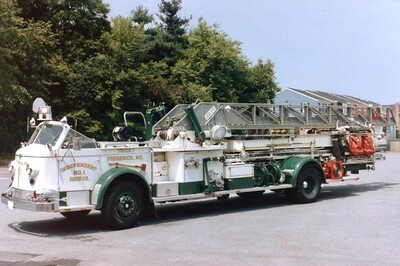 Independent's former Engine 11, a 1988 Seagrave HB, 1250/500. 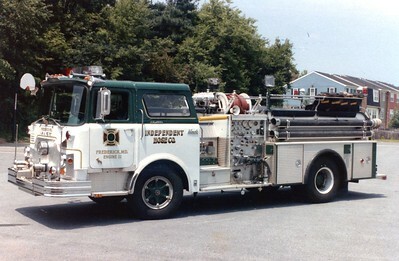 Engine 12 was a 1984 Seagrave HB30DF, 1000/500, sn- R79447. Sold to Hillendale, Maryland, in 1995. Sold to Mooresburg, Tennessee. 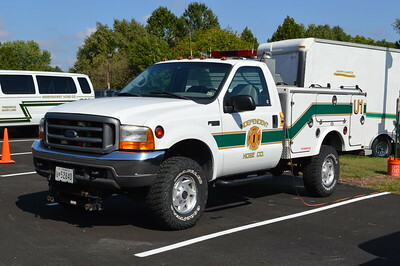 Sold to Lakeview VFD in Rigersville, Tennessee. Totaled in an accident in 2010. 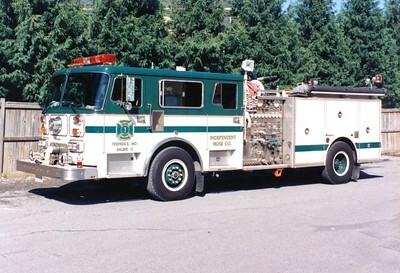 Engine 11 was a 1972 Mack CF/1981 4-Guys, 1000/500. Rehab following crash with police car. 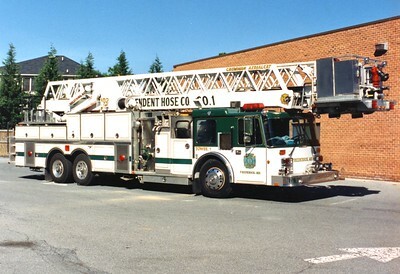 Transferred to FD training academy in 1992. Bought by a collector in Maryland in 1997 (who also owns 1952 Mack L). 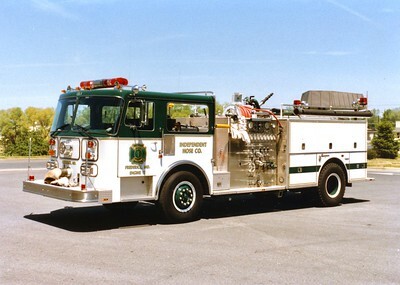 Engine 12 was a 1972 Mack CF/1982 4-Guys, 1000/500. Donated to Mountain Fire/Rescue, California, in the late 1980's. 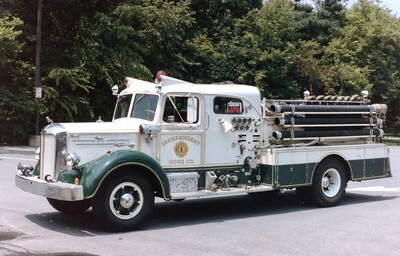 Former Engine 13, a nice 1952 Mack L Type 19/Boyertown Auto Body Works, 1000/500. Sold to a collector in the Houston, Texas, area. Back to a collector in Frederick, who also owns one of the 1972 Mack CF's. 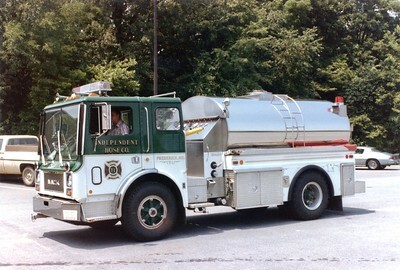 Tanker 1 was a 1980 Mack CF/4-Guys, 350/2000. Totaled in 1994 during accident. Tower 1 was a nice 1988 Duplex/Grumman, 1500/200, 102'. Destroyed in 2000 at a fire at the KME plant in Roanoke, Virginia. Former Truck 1, a beautiful 1952 American LaFrance 700, 100gpm pump, 100' ladder. Frederick purchased it in 1982. ex - Auroza, Colorado. 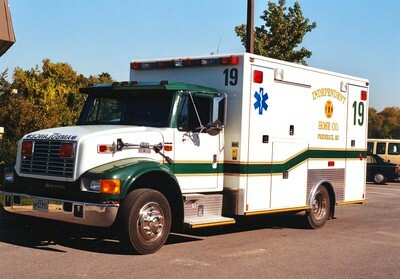 Former '19', a 1998 International 4700/Medic Master.